The Specialty Recruitment Assessment (SRA) plays in important part in the shortlisting and assessment process for 8 different specialties: GP, Radiology, Ophthalmology, Obstetrics and Gynaecology, Psychiatry, Neurosurgery, Child and Adolescent Mental Health Services (CAMHS) and Community Sexual and Reproductive Healthcare (CSRH). It is also known as the Multi Specialty Recruitment Assessment (MSRA). 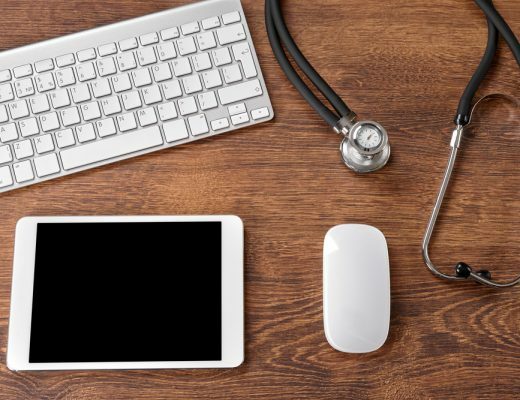 It will be done entirely on computer, and consists of two parts lasting a total of 3 hours 5 minutes – a clinical problem solving section and a professional dilemma section. Each specialty uses the results of the SRA in a slightly different way in the recruitment process for ST1 / CT1 posts – in most cases, the score is used both to shortlist for interview / selection centre, but also carries over and makes up a part of your overall ranking (the rest coming from interview / selection centre). For applicants to GP or Psychiatry, an exceptional score (~top 10%) can lead to a direct offer without needing to attend the next stage. Picture questions – this could include skin lesions, fundoscopy, blood reports, ECGs etc. Algorithm questions – you may have to drag boxes into the right part of the algorithm or select the correct answer from a list. Algorithms could include BLS / ALS / important guidelines etc. Question may relate to diagnosis, investigation or management of both common and important diseases as well as rare but serious presentations. 1. A 25 year old man is involved in a road traffic accident. He was on a bike and hit from the side. He did not want to attend the hospital, and was taken home by his friends. He now complains of severe pain in his lower back and cannot pass water. He has tingling in his legs below the knee. Select the most suitable investigation from the list. 2. A 68 year-old woman with known osteoporosis. She has had a fractured neck of femur in the past after a fall in her garden. She now complains of pain in her lower back, but does not have much muscular tenderness. She has no bowel or bladder symptoms. She has no neurological symptoms. Select the most suitable investigation from the list. 3. A 40 year old labourer attends complaining of severe low back pain after finishing his shift. He does not have any bowel or bladder problems, and on examination has a straight leg raise of 90 degrees in both legs. He has no other significant medical history. Select the most suitable investigation from the list. 4. A 35 year old man has a severe allergic reaction while in hospital. He has no history of past allergic reactions. Which ONE of the following is most likely to cause a reaction WITHOUT prior exposure or sensitization? Select ONE answer only. 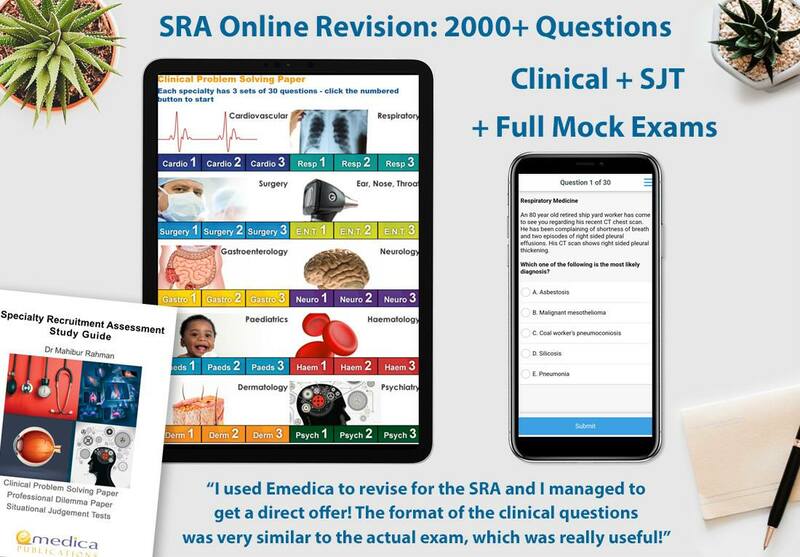 Click the image below for details on how to access over 2000 realistic exam level questions to help you prepare for both papers in the SRA. This is a 110 minute assessment with 58 situational judgement test questions (SJT). 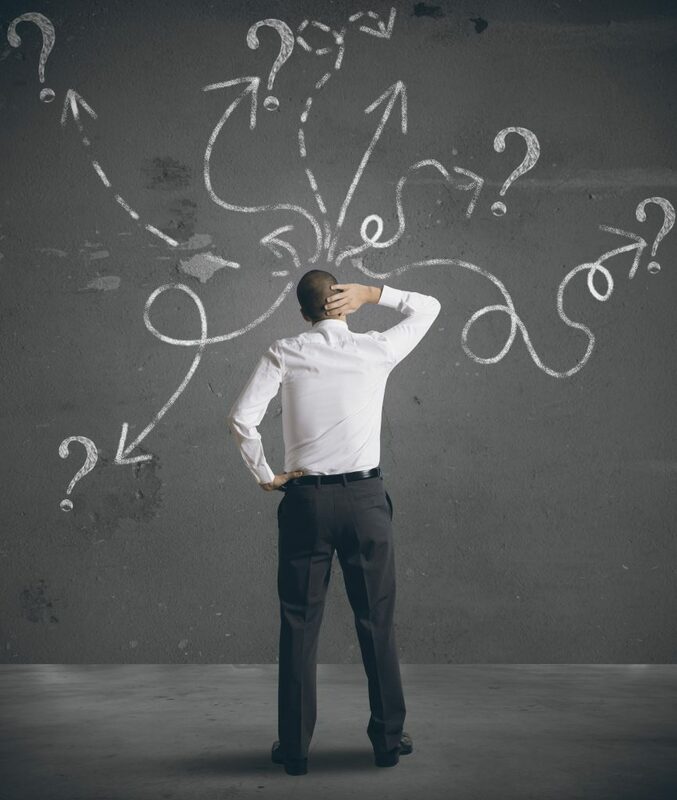 Questions test judgement and decision making in a workplace context. It also assesses knowledge of important ethical and medicolegal guidance from the GMC. Questions assess 3 domains – empathy and sensitivity, coping with pressure, and professional integrity. There are two types of SJT questions in equal proportion. The questions in section 1 ask you to rank 4 or 5 actions from best to worst in the context of a workplace scenario. The questions in section 2 ask you to select 3 actions that taken together make the best response to the situation. There are up to 8 options to select from in this type of question. You have just started a job as a medical F2 in a new hospital. Your partner has a chest infection, and is not yet registered with a GP and has asked you to prescribe antibiotics. A. Prescribe the medication as a private prescription, and arrange for your partner to register with a GP the following week. B. 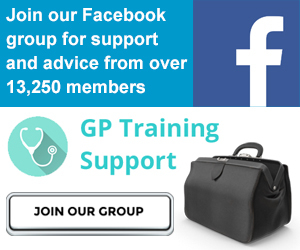 Tell your partner to register with a GP locally. C. Prescribe the medication on a hospital take home prescription with your partner’s details on it. D. Prescribe the medication on a hospital take home prescription with one of your patient’s details on it. Collect the medication from the hospital pharmacy. E. Pressure one of your FY1 colleagues to write a prescription on a hospital take home script without seeing your partner. A. Ask her daughter to sign the consent form and state that she is the daughter. B. Inform your consultant she has dementia and ask him to complete the consent form. C. Encourage the patient to sign the form as the procedure is in her best interests. D. Exclude any acute causes that could be worsening her confusion. E. Discharge the patient as she will be unable to have surgery without consent. F. Cancel the patient’s operation. G. Ring the theatre to rearrange the list so this lady is lower down on the list. H. Complete the consent form on the patient’s behalf as it is in her best interests. 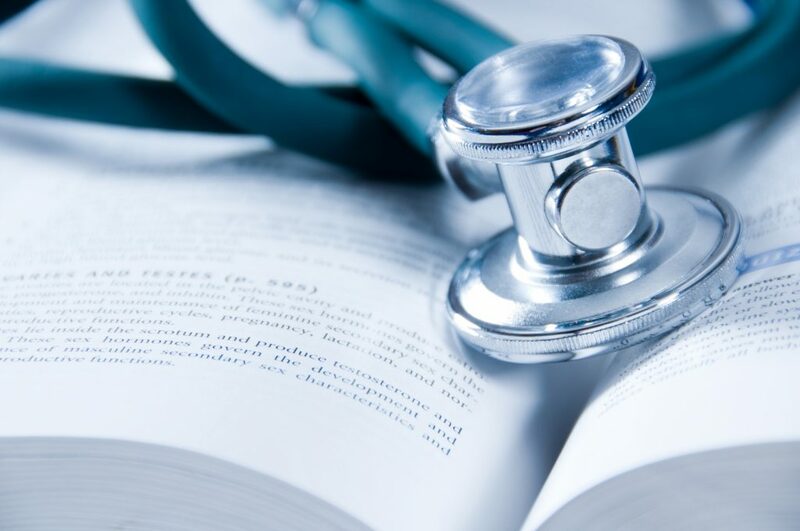 It is important to allow enough time to prepare for both papers – some specialties use the scores as part of a ranking process to determine eligibility for interview / selection rather than as a pass / fail criterion. In most cases the SRA score carries over to the next stage and is added to the interview score to determine overall rank so it is important to do as well as possible. 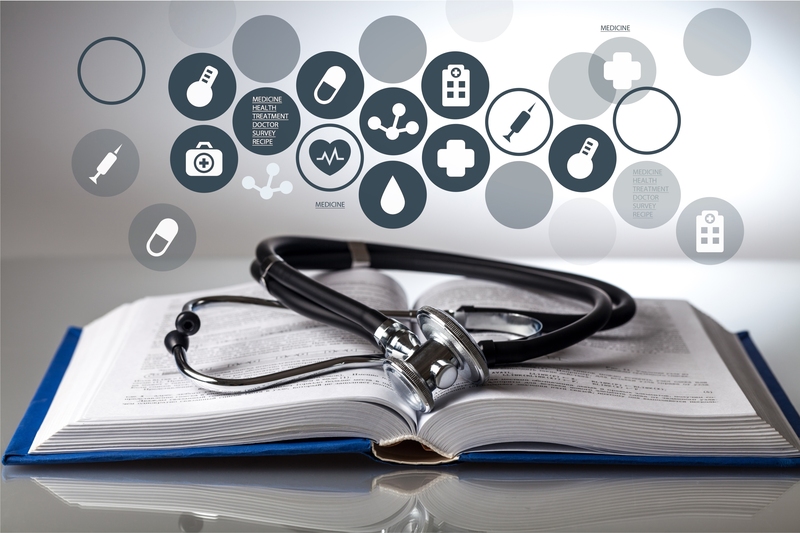 Try to combine reading to cover the key clinical theory (Oxford Handbook of Clinical Medicine and Oxford Handbook of Clinical Specialties) and understand key GMC ethical guidance with practising sample SRA questions to develop exam technique and get a feel for the different types of questions. As you get nearer the time of the exam, you will benefit from doing a timed mock exam to get used to the pressure of the exam. I hope this article has given you a clearer understanding of what to expect in this important assessment. I wish you every success with your revision and in getting a place on your chosen rotation. Dr Mahibur Rahman is medical director of Emedica, and has helped thousands of doctors prepare for this type of assessment since 2007. He teaches on the popular Specialty Recruitment Assessment Crammer course which covers both papers. This course helps hundreds of doctors get into training, including many who get direct offers!